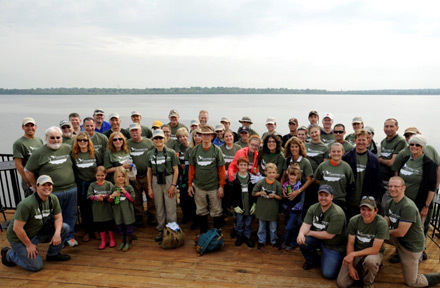 Fifty-one volunteers gathered along the Onondaga Lake western shoreline Saturday, May 16, to create homes for wildlife by building and installing bird boxes and planting native plants. The volunteers built 24 bird boxes and planted 1,250 native plants. Corps volunteers construct and install bird boxes to attract Eastern bluebirds and tree swallows. The boxes give birds a better chance to survive and thrive, reducing declines in population and restoring species to places they once inhabited. When birds nest in the structures, they are most likely to raise their young successfully. 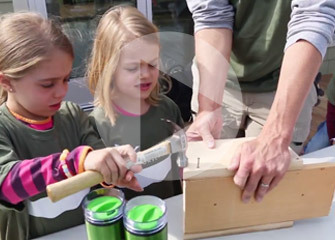 Seven-year-old Sammie and her sister, 5-year-old Ali, of Manlius, New York, work with their dad, Mark Bremer, to build a bird box. 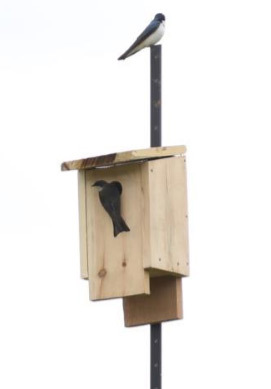 Tree swallows use a bird box just minutes after it was installed Saturday. Click to watch a video from the event. Volunteers plant native species including prairie cordgrass, soft rush, swamp milkweed, New England aster, and fox sedge along Onondaga Lake’s western shoreline. Left: Six-year-old Grace Cahill, of Clay, New York, plants New England aster. Right: (left to right) Volunteers Peter Haun, Nicole Schmidt, Lawrence Keefe, and Diane Haun, all of Syracuse, plant soft rush. Honeywell’s work along the lake’s western shoreline will transform 20 acres into new wetlands and improved habitat for wildlife that will play a significant role in creating a healthy Onondaga Lake watershed and a sustainable ecosystem. In July 2014, Corps volunteers planted native wetland plants along the western shoreline. The area, shown above, is now thriving. As members of the Onondaga Lake Conservation Corps, volunteers pledge to protect and conserve the natural resources of Onondaga Lake, promising to educate future generations about becoming caretakers of the water, air, land, and wildlife. On the shores of Onondaga Lake and along the lake’s tributaries, Honeywell is improving a total of 86 acres of wetlands and planting about 1.1 million plants, shrubs, and trees. To date, more than 323,000 plants, shrubs, and trees have been planted and 44 acres of wetlands have been restored. “The volunteer efforts will help attract a wide range of species to the shore of the lake,” said Tony Eallonardo, Ph.D., a scientist at O’Brien & Gere, pictured above, far left. Right: Corps volunteer Ruth Florey, of Syracuse, tracks native birds along Onondaga Lake’s western shoreline. Since the formation of the Corps in summer 2012, 570 volunteers have become environmental stewards and Corps members. In recognition of their work, the U.S. Environmental Protection Agency recently honored the Corps with a 2015 Environmental Champion Award. The Corps seeks to inspire future stewards of Onondaga Lake and its watershed through a hands-on, experience-based program that offers citizens and organizations the opportunity to participate in activities that help restore and sustain Onondaga Lake and its value as an Important Bird Area. Founding members of the Corps include Audubon New York, Montezuma Audubon Center, Onondaga Audubon Society, Parsons, O’Brien & Gere, and Honeywell. To learn more about the Onondaga Lake Conservation Corps or participate in future activities, please contact montezuma@audubon.org or call 315-365-3588. Schools, community groups, local organizations, and individuals are welcome. Like the Corps on Facebook or visit YouTube to learn more.